We would tell new patients who may be unfamiliar with chiropractic that a spine is a machine. Like any machine, it needs to have balance and symmetry. When your body is balanced, it moves correctly and can last a long time. Most misalignments start with a foundational problem – with the pelvis. This lower part of the trunk endures many stresses. Just about everyone presents with some misalignment in the pelvis. We help patients understand that that’s where their problem starts – it’s unlikely to be dramatic things but activities they do every day. For example, with the amount of sedentary type work involved in our modern lives that’s where a lot of these problems start. We are designed to move not to sit for 8 hours a day. Once we have the information from the exam that we perform, we will give each patient a bit more in-depth talk about the spine. 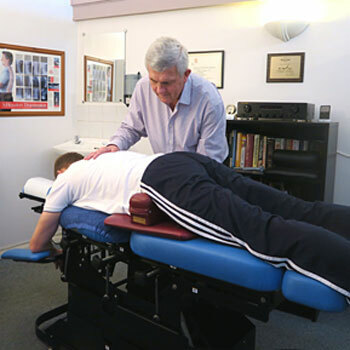 We try to get patients to understand how vital it is to get adjusted. Chiropractic has many benefits, including helping you be more comfortable and move better. If you are able to move correctly, you’re not going to develop osteoarthritic problems and need hip replacements when you’re older. Believe it or not, a lot of arthritic problems develop in the 30s. With chiropractic, you’re not just comfortable in the short term. Instead, through maintenance care, you can stay well for the long term and be a blessing to your family in your senior years. Imagine being able to play with your grandchildren— pain-free — and having a much more meaningful life overall. Because we mostly see patients with an unstable foundation being the pelvis, the initial period of care is twice a week for four weeks for that type of patient. Once we provide stability, we perform a re-exam to determine how much improvement the patient experienced and how much stability they have. After that acute care stage, they progress to long-term maintenance care, which may be once a week for a while and then lessen to once every few weeks, and eventually to perhaps once a month or every six weeks. Many of our patients see us for maintenance care because they feel great and want to stay that way. If you’ve never been to a chiropractor before, you may be unsure of what to expect. Rest assured that our approach is surprisingly gentle. We use a variety of techniques and get outstanding results for patients. You don’t have to hear bones crack to experience benefit! Experience natural chiropractic care for yourself. Contact us today to schedule a same-day appointment!